This is a rich and sophisticated cake filled with three different and distinct ginger flavors. This cake is spiced with ground ginger and incorporates a grated ginger into the batter. Finally, the cake in studded with chopped, candied ginger, giving it a chewy texture. 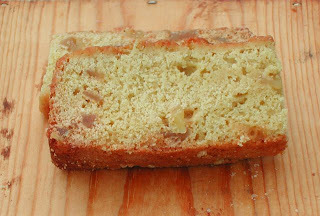 In this cake, it is important to chop the candied ginger into uniform pieces as the weight of the ginger often causes it to sink. I like to chop them roughly the size of a peanut. The ginger needs to be dredged boldly. As with other cakes cooked slow and long, you want to keep the fruit suspended in the batter. Coat the pieces of ginger with as much extra flour as needed to leave them dry, but remember not to incorporate additional loose flour into the recipe. One trip to keep the ginger from collecting on the bottom of the cake is to add half the batter before folding in the crystallized ginger. Fold the ginger into the remaining batter and add. Sift the flour, sugar, baking powder, salt, ground ginger into a large bowl. With your fingers, work the butter into flour mixture until you have a coarse crumb. Add vanilla, milk, grated ginger and stir. Fold in the dredged crystallized ginger. 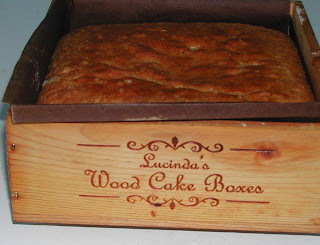 Pour the batter into a lined wood cake box. Bake at 300 degrees for 90 minutes.